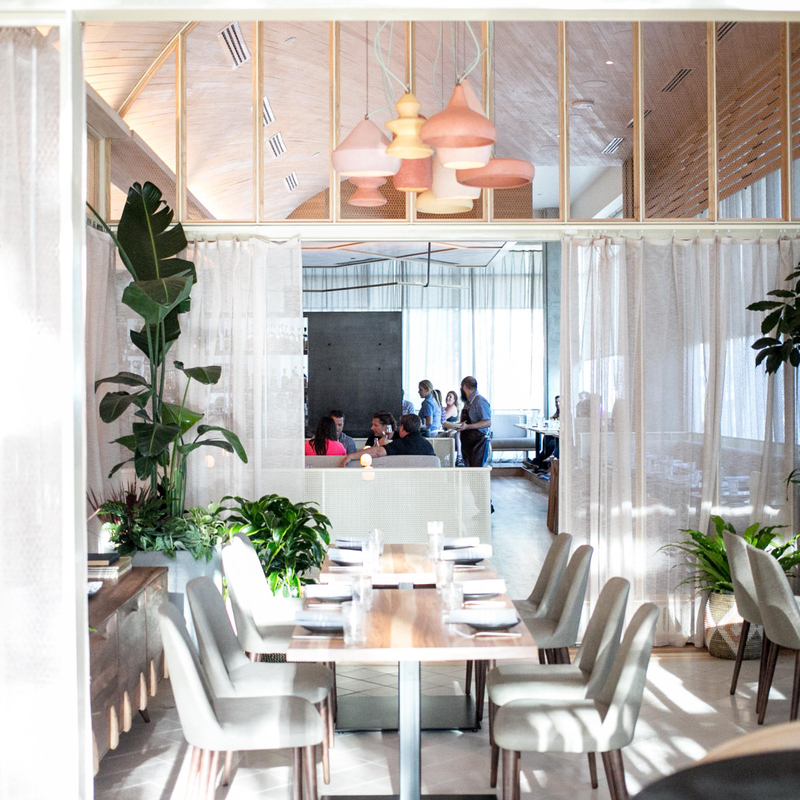 This month's roundup of where to eat includes a handful of buzzy new restaurants, as well as a couple favorites that have recently changed menus or added new seasonal offerings. 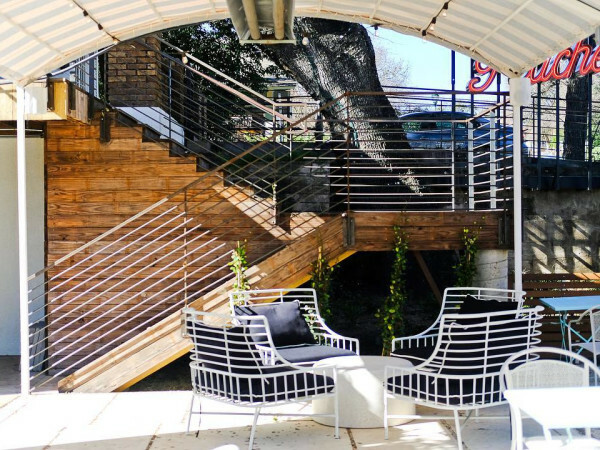 Here are seven hot spots to dine in Austin this month, from breakfast to dinner. This cocktail lounge and restaurant has recently updated its food and beverage program, adding a weekend brunch offering a variety of savory and sweet selections and cocktails. The new dinner menu, served from 5 pm to 1:30 am, features shareable dishes with a Southeast Asian slant. 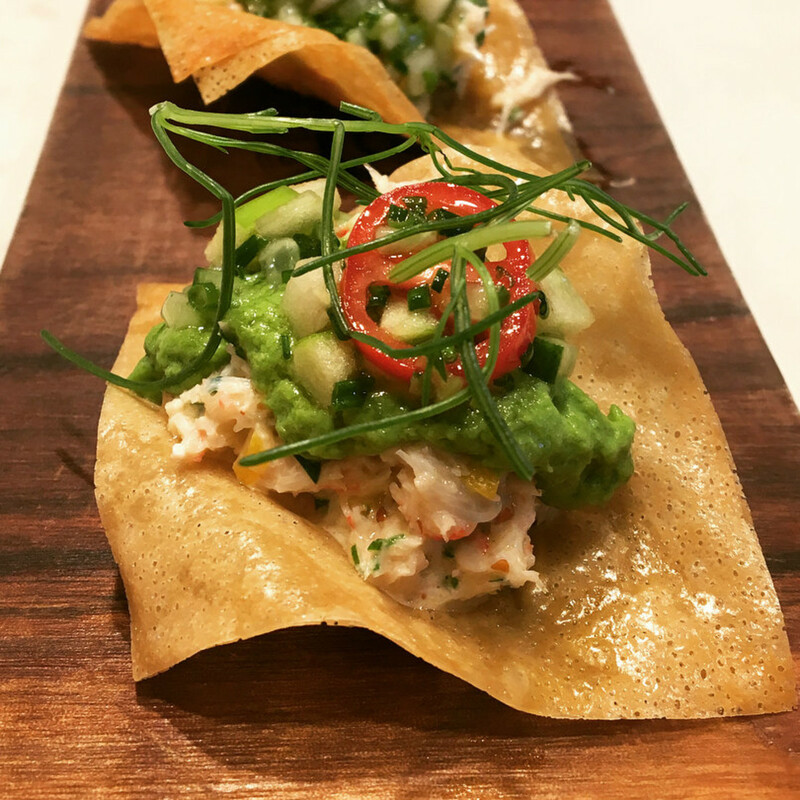 Don’t be fooled by the name, the poke nachos — wonton chips topped with sashimi tuna cubes and avocado, shishito dust, cilantro, and a trio of savory sauces — are way better than they sound. We loved the wild Texas boar ribs with a tomato-based Filipino barbecue sauce, and the green tea soba noodles and vegetables in a rich Thai-style coconut curry broth. For something heartier, the Burmese fried rice bowl, topped with charred bok choy, water chestnuts, seasonal vegetables, and a fried egg, was superb. If you like spice, ask for the house-made chili paste. Be sure to ask your server for drink suggestions to pair with your food. Ah Sing Den has a new cocktail menu that includes the spicy Maria Victoria, which combines mezcal, lime, toasted Thai pepper syrup, and cilantro over crushed ice, and the Burmese Mission, a blend of gin, lime, Thai basil, and clementine togarashi. The new, all-natural wine list features a small but well-curated selection, and sake and beer are also available. Finish your meal with some tea, served in gorgeous exotic teapots. 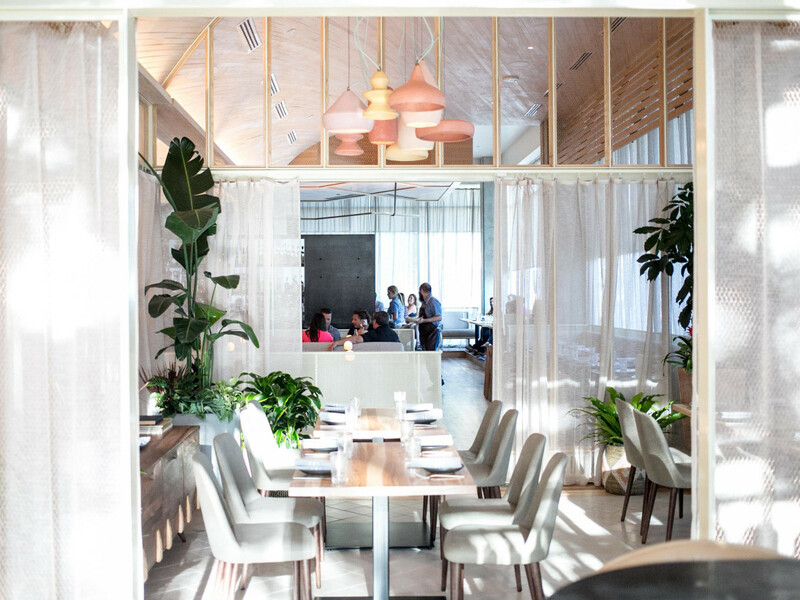 We are smitten with this downtown modern Mexican restaurant, from its sunny and bright interiors to the comfortable seating, excellent cocktail and wine selections, and expertly prepared fare inspired by high-end Mexico City eateries. 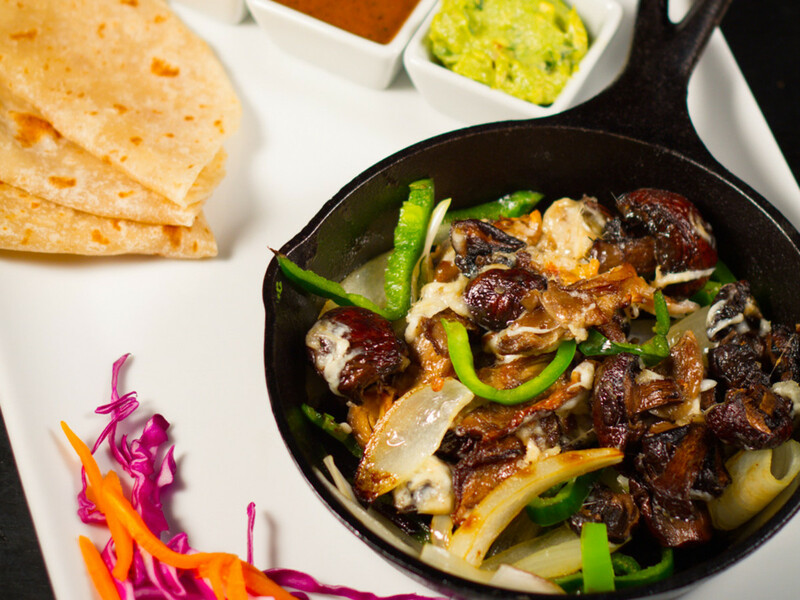 Happy hour offers an opportunity to try discounted items like the tacos, served in house-made corn tortillas and filled with a selection of four different guisados. The guacamole is among the freshest we’ve had in town, and the salsa sampler is not to be missed. 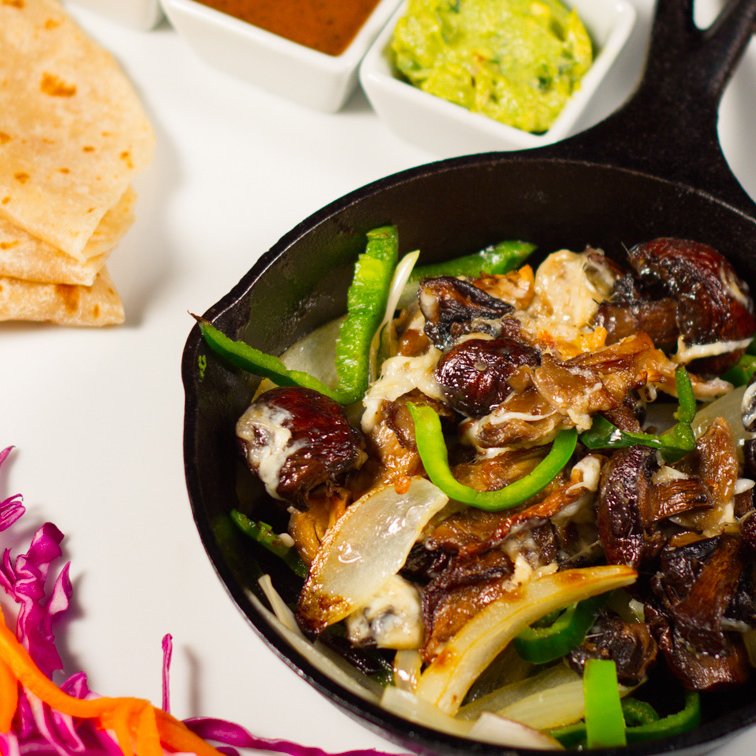 Be sure to try the chicken in white mole; it is a revelation. If you are a carnivore, you can’t go wrong with the pibil-style pork tomahawk, served with salsa verde, white onion, cilantro, and pickled pineapple. For something refreshing, the borracho snapper with cilantro-basil aguachile, key lime juice, and mezcal is a sure bet. 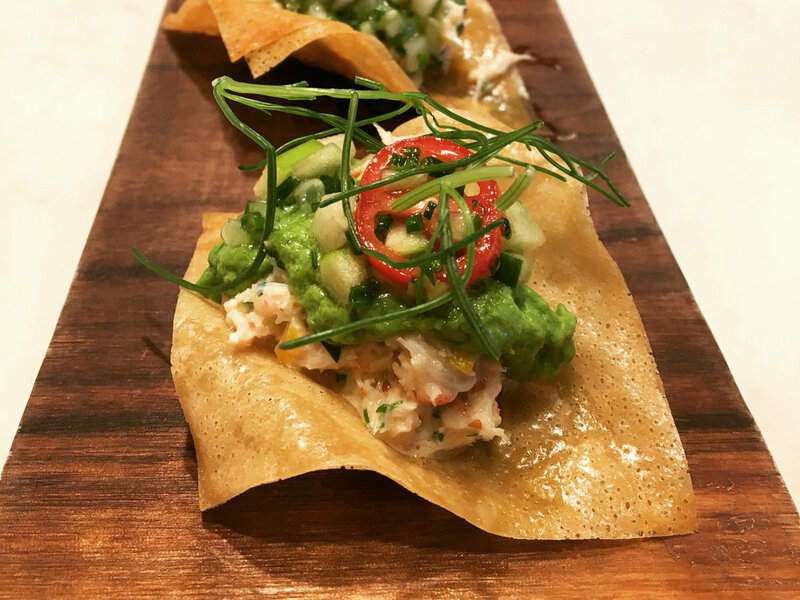 Speaking of mezcal, ATX Cocina offers a good selection, including different regions and varietals, served the traditional way with orange wedges and organic sea salt flavored with agave worm, which the team imports from Mexico City. This neighborhood newcomer is packing the house thanks to its straight-forward Latin-inspired fare and family ambiance. Start with the shiny ribs, a Latinized version of Chinese barbecue ribs, or the addicting papas rellenas, crispy fried potato cakes filled with goat cheese and served with one of their signature salsas. 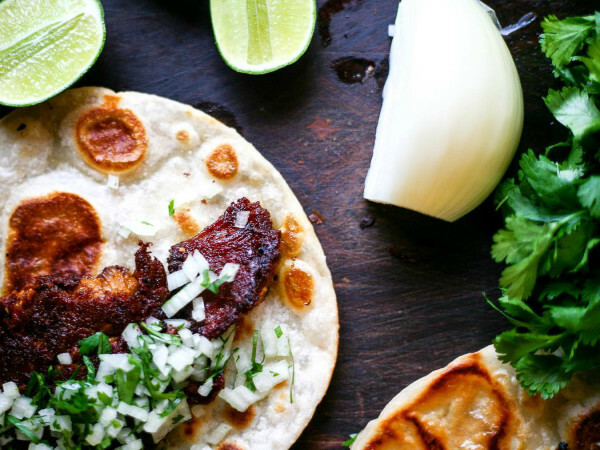 Entrees range from crispy tacos and tostadas to various enchiladas, salads, and guisados. The beverage program, curated by bar manager Laura Beck, offers a good selection of wine, beers on tap, and fresh lime margaritas. Breakfast is served daily, with a menu that includes breakfast tacos and bowls, biscuits and gravy, and a cinnamon roll topped with maple candied bacon. There is a special children’s menu and drinks that include Maine Root sodas. This happening “brunch all day” spot and grab-and-go bakery counter caters to people who crave breakfast at all hours of the day. The menu features a variety of breakfast sandwiches; pancakes with fried chicken strips and Sriracha butter; a massive kolache stuffed with migas and queso, topped with jalapeño slices; and the Bombshell Burger, a sinful choice topped with shaved ham, hash browns, American cheese, and house-made ketchup. 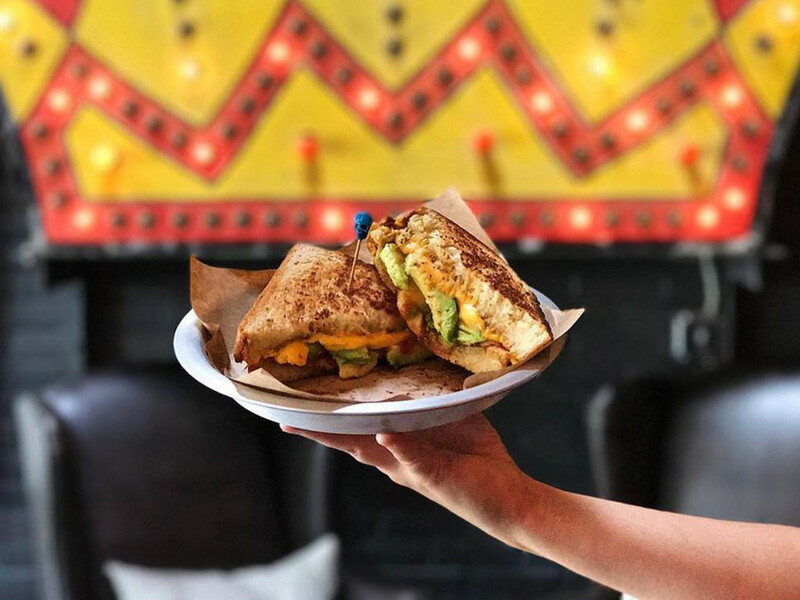 But we can’t seem to stop ordering the Grilled Cheesus, with gouda, mozzarella, and cheddar on buttered toast, with tomato jam and avocado. During traditional brunch hours on the weekends, the "Sunday School" menu features pastry and cocktail specials from a "seven deadly sins" display, as well as weekly drink specials concocted by bar director Jen Keyser from anonymous confessions left by customers. There are many reasons to recommend this wonderful Italian spot in Mueller, from the socially responsible business model to the sanctuary restaurant status, comfortable atmosphere, and excellent farm-to-plate fare. Just last month, they added a monthly menu focusing on regional foods from various Italian provinces. The Italian Menu Project started with an homage to Sicily, and this month it moved to Campania, a southern region on the shores of the Mediterranean that is home to Mount Vesuvius and Napoli. Chef Fiore Tedesco is excited to feature pizza fritte, a Neapolitan street specialty of sourdough pizza crust filled with mushrooms, house-made taleggio cheese, and mushroom honey, or with fresh mozzarella, sausage, and gypsy peppers, then fried. This week, the restaurant offers a three-course menu for $29 that includes Caprese with mozzarella made every day before service, F-Stop Farm heirloom tomatoes, La Flaca Red Freddy basil, colatura (Italian anchovy sauce), and olive oil; your choice of pizza fritte; and Fior di Latte gelato with olive oil streusel for dessert. Wine selections from the region include several Aglianico by the glass and by the bottle, a flight featuring Falanghina and Greco from Beneventano, and a Fiano di Avellino available by the bottle only. The Campania menu will be available through Labor Day. On September 7, it will be Abruzzo’s turn. 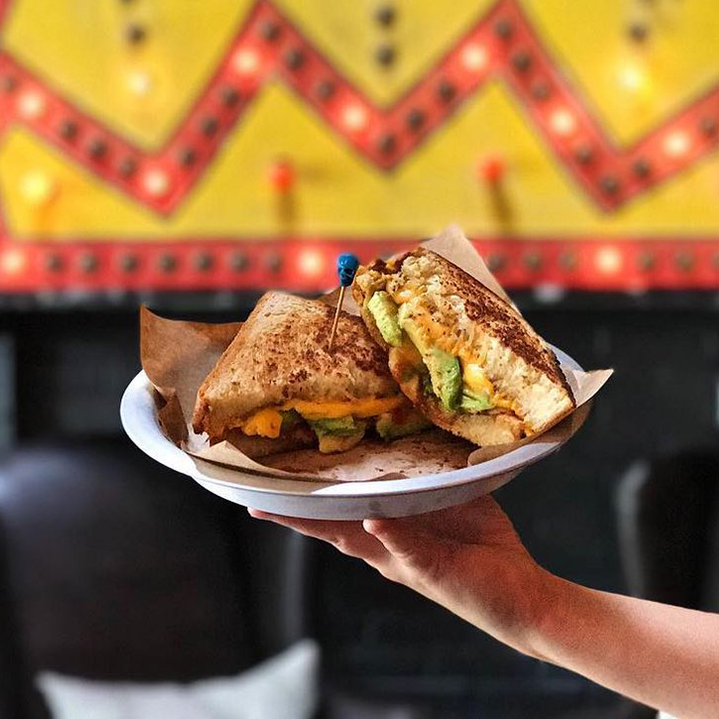 This super cool downtown hostel has an informal and comfy restaurant and bar serving varied American fare from breakfast to late-night snacks and a weekend brunch. The space is artsy, with a modern-industrial style warmed by touches of wood, copper, and fabric. 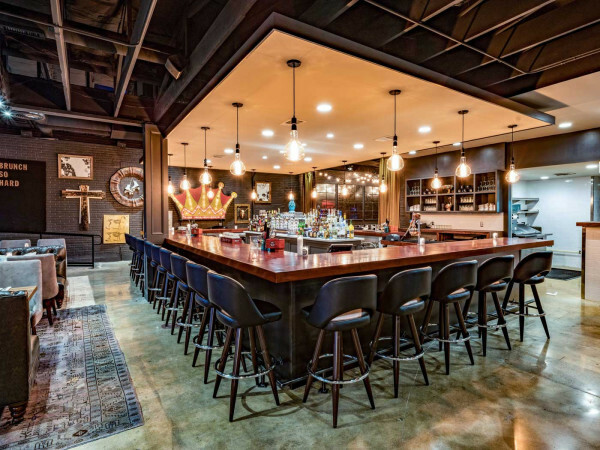 The bar, which surrounds the open kitchen, is a wonderful perch from which to watch the action, but cozy corners, comfy couches, and communal tables allow quiet dining and even serve as working spaces. The menu is short but sweet, featuring reimagined classics like burgers; waffle fry nachos topped with brisket (or vegan chorizo), queso fresco, and pico de gallo; and beet pickled deviled eggs seasoned with horseradish, bacon, and fried capers. There are plenty of vegetarian options such as a seitan buffalo burger and a tempeh wrap. For something fancier, try the duck confit salad with fried pancetta, fontina, pickled radishes, brown butter-sage croutons, avocado, soft boiled egg, and red wine vinaigrette. The newly launched brunch features breakfast tacos, chilaquiles, and cardamom French toast. The bar serves Texas beer on tap; a clever wine list; and great cocktails like the Mez-Can martini, a playful version of the popular drink made with mezcal, orange liqueur, lime, olive juice, and a sea salt lime foam. Chef Joe Anguiano recently released a late summer menu that warrants a visit to Lamar Union. Some of the new items include lavender-bathed asparagus with smoked yogurt and Meyer lemon oil; crunchy chickpea fritters with fresh burrata cheese, roasted campari tomato, and wild herb pesto; tender sea scallops with miso soubise, melted onion, fennel, and tarragon; and grilled pork short ribs with cauliflower puree, cauliflower crumble, grilled figs, lemon verbena, and za’atar. The kitchen is also welcoming pastry chef Timothy Roberts, who honed his skills in Michelin restaurants from New York to Hong Kong. His dessert creations are artful and adventurous, like the Keep It Berry Weird: caramelized white chocolate cremeux, guava foam, yuzu curd, strawberries, and fresh figs. Bartender extraordinaire Madelyn Kay’s summer libations menu is full of playful cocktails with quirky names. Try the stunning Day Three of Your Juice Cleanse, featuring Bombay Sapphire gin, chamomile and lavender infused pilsner, Thai lime leaf honey, lemon, lime, pineapple, beer foam, and a gorgeous bright blue butterfly pea flower garnish. For something completely different, go for the Clarified Milk Punch: Basil Hayden bourbon, Batavia Arrack, 10 year tawny port, strawberry, lemon, nilgiri black tea, and rose water. Ask your server to tell you how Kay came up with this cool cocktail process.